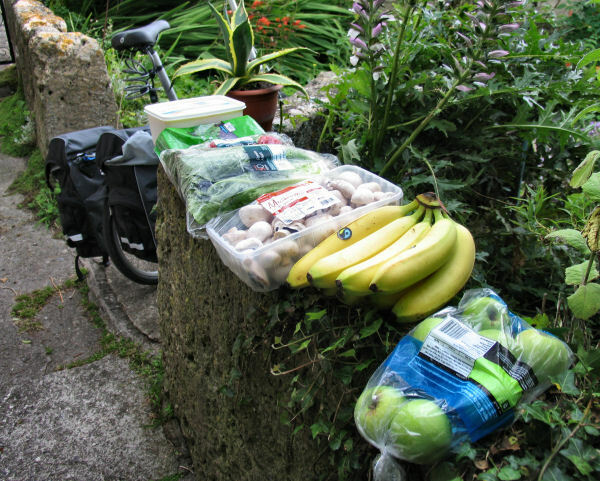 I suppose that one argument that could be raised about shopping and cycling, is that it is not really possible to go shopping to the local supermarket by bike. I am using my car very infrequently now. The reason being I can keep fitter, save fuel and money. So why not try shopping by bike? I am over 66 years old and cycle from Freshford to Bradford on Avon to swim a few times a week. I have even shopped at Marks & Spencer in Bath recently. I don't think I'll be cycling to Swindon's Link Centre to ice skate which is 64 mile round trip though, unless I camp out on the way back! Mushrooms- a value box, bananas, tomatoes, apples, romaine lettuce, raisins and ice cream. A total weight of 5.6kg (over 12 pounds) The shopping was placed in my pannier bags and I could quite easily have bought meat, eggs, milk and bread, and some more vegetables if necessary as there was enough room in the bags. I make my own bread anyway, but even so there was room for flour. Notice that these are family quantities. I think that I could go shopping by bicycle twice a week and buy all I need. Although Freshford and the surrounding countryside is very hilly it is possible to shop by bicycle rather than use the car. We could also make a sustantial contribution to saving precious resources by cycling, be fitter and save money! Yes, I do that as well. Shopping by bike take a lot of time compared to going by car. I sometimes use a home delivery service and stock up my chest freezer.